Some of the ads on this video may offend certain viewers, so if that is the case with you, you might not want to proceed further. My sincere apologies if anyone is offended. The show itself is suitable for all ages, a typical sassy coming of age story. It is in Japanese with English subtitles. Crunchyroll (see below) is airing "Ping Pong the Animation," a new series from Masaaki Yuasa of "Kick-Heart." It is broadcast every Thursday starting on April 10, at 10:00am Pacific Time. This is episode 1, in case you might be interested. 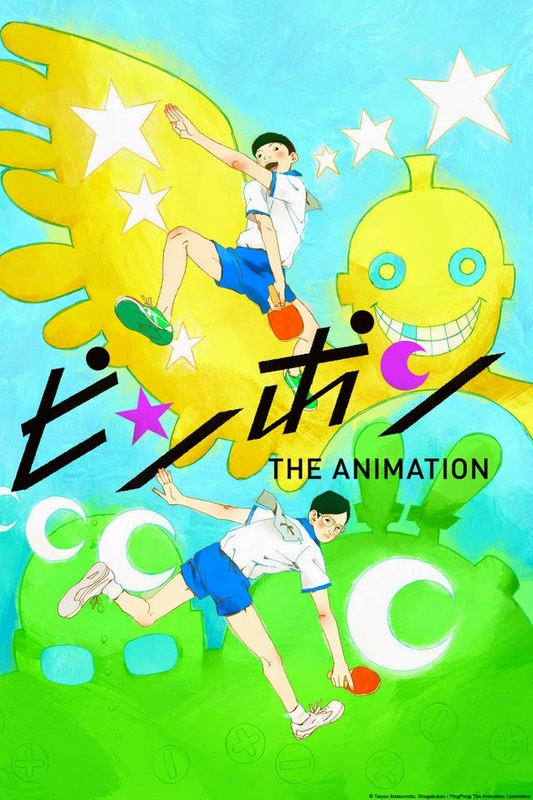 "Ping Pong the Animation" derives from a manga by Taiyou Matsumoto. It is being turned into anime and airing in Fuji TV’s block, noitaminA. High school student Yukata Hoshino, nicknamed Peco, and his childhood friend, Makoto Tsukimoto, nicknamed Smile, play at a local table tennis club. Smile is somewhat withdrawn and doesn't try to win too hard, so he always loses to Peco. The club works on this so that Smile will be more aggressive and learn to win. Director Masaaki Yuasa worked on “Mind Game” and crowd-funded Kick-Heart. Tasunoko Production, which also produces the 2013 series Gatchaman Crowds, creates the animation. Fukujuro Katayama is Peco, and Kouki Uchiyama, also known as Ichika Orimura from Infinite Stratos, is Smile. Crunchyroll, for those who don't know, is a US website that is devoted to streaming Japanese and other Asian anime. It has been around since 2006 and apparently is funded by The Chernin Group and TV Tokyo. Some content is free and some requires a subscription. It offers hundreds of Asian shows. We are not promoting Ping Pong The Animation or Crunchyroll or anything, this is presented strictly for educational and review purposes. It's good to know what the various outlets are for anime if you are really into animation (like us). Whether or not you are into this field of animation, Asia is where a lot of animation growth takes place. Considering yourself knowledgeable about animation and not following developments in anime is sort of like calling yourself a tea expert and knowing nothing about British teas. Ping Pong the Animation is available to Crunchyroll’s audience in the following territories: Europe (excluding Russia and UK), Algeria, Bahrain, Comoros, Djibouti, Egypt, Eritrea, Iraq, Jordan, Kuwait, Lebanon, Libya, Mauritania, Morocco, Oman, Palestine, Qatar, Saudi Arabia, Somalia, Sudan, Syria, Tunisia, United Arab Emirates, Yemen, Cyprus, Iran, and Israel. It is not available in the UK for streaming, and there is a 6-month delay for viewers in French-speaking regions.